"I know that you belong to me," Robert read in amazement. I JUST can't begin to tell you how bored I was. I went up to her and said: "Clairette, it's been the most lovely party. I'm terribly sorry I've got to go... but I've the worst sort of headache and I must lie down. I've had a lovely time...."
"But not at this party?" she asked, with a smile that was definitely acid. "Of course, Mignon, darling, I'm awfully sorry you've got to go. I must say you look a little tired... but then you've been to see that fortune-telling woman this afternoon, haven't you? Did she depress you?" "Not particularly," I said. I was frenzied to get to my own apartment—which is next to Clairette Glynn's—because we had a cocktail party due to start in a few minutes and I wanted to see Robert—Robert is my husband—first. "On the contrary, she was really rather hopeful," I added. I began to move towards the door. She said over her shoulder: "Was she? I'm so glad for you. I thought she might have said something depressing about Robert! Good-bye, darling." I wriggled through the crowd and made my way into the hall. I wondered exactly what she had meant by that last snooty remark. I began to think about the fortune-teller. Why women ever go to fortune-tellers, I don't know. To pass the time, I suppose. But this one had seemed very definite. She'd said that I was to meet a slim, good-looking, dark-haired man; that he was to cause trouble in my life; that I should beware of a disagreement with someone very close to me—that would be Robert. Sebastian Glynn—Clairette's husband-was standing by the entrance door. He is head over heels in love with his wife and lets her know it too often. He is short, plump, vague, slightly short-sighted, and depressing. He hissed in my ear: "Mignon, I've got to talk to you for a moment before you go. Please... just one moment!" He took me by the hand and dragged me into the dining room. He said: "I'm fearfully worried about Clairette—terribly worried." I said: "Yes, Sebastian? Is she worried, too?" He shook his head. "A woman only worries about the future before marriage," he said grimly. "A man does the worrying afterwards. Mignon... believe it or not, there is another man!" "Not another! The trouble with Clairette is that she has a head like a door-knob. Anyone can turn it." I felt slightly better after that one! He hissed: "This time it's serious. Mignon, I've got to go back now, otherwise Clairette will miss me. For pity's sake, ring me up later when she's gone out and tell me what to do. She says she's going off with this man. He's a poet or a writer or something equally repulsive." He pressed a folded sheet of notepaper into my hand. "This is a letter she had from him this morning. Take it away, Mignon, read it, and think about the whole thing and telephone me. Clairette says she can't bear me any longer; that she wants a divorce. I'm going mad—but mad!" "You're not going mad," I said. "You are mad. She probably wants a new hat or something." "I must go," he said, "or she'll suspect. Promise you'll telephone me at ten o'clock to-night." "Oh, very well," I said, "I'll do that." I walked out of the dining-room and sneaked through the front door. I felt rather more depressed. I didn't see why I should get mixed up with the affairs of Clairette and Sebastian and "the other man." I regretted going to her cocktail party. I walked down the corridor and let myself into the flat. 1 looked across the hall and saw, through the half-open door of the drawing-room, that some guests had already arrived. Then I heard Robert's voice talking to somebody. I breathed a sigh of relief and slipped quickly into my bedroom. I switched on the light, dosed the door, and read the letter which Sebastian had thrust into my hand. After our last talk I know that you belong to me: that I must take you away from him.... 'To where the nodding flowers bend, we'll wend our way until the end.' Charming, don't you think? He is not the man for you, dearest. He doesn't understand you. How could he? He is coarse, materialistic, and could never realise the subtle and innate nuances of your sweet nature... 'Oh, doubly blest, oh, dearly missed, oh, sweetly met, oh, dearly kissed....' Doesn't that describe you, my own... but actually... definitely? I know that you are dining out to-night. While you are out I shall come to the flat and see him. I shall tell him that I am going to take you away. His blustering and bullying will not affright me. I felt vaguely sick, except that the idea of the unfortunate Sebastian blustering or bullying anyone was rather amusing. I threw the note on my dressing-table. Now my head was really aching rather badly. I took off my hat, sneaked across the hall, down the long passage. I went into the bathroom and bathed my temples with eau-de-Cologne. I stood there, in front of the mirror, putting my hair to rights and wondering how I could possibly advise the unfortunate Sebastian. Of course, the honest thing to do was to tell him to let things take their course. If any woman ever deserved Hubert—whoever he was—Clairette did! After a while I gave it up and walked into the drawing room. In a moment I was surrounded by all the people who wanted to talk to me, while out of the corner of my eye I was looking for Robert, who—at that moment—was the one person to whom I wanted to talk. I could not see him. I wondered what had happened to him. Just then, Annette, my maid, passed me with a tray of cocktails. I stopped her. I asked her if she knew where my husband was. "_Mais oui_, Madame," she said. "'E went away joos some leetle time ago. 'E ees in the library weeth a gentleman." I went on talking to people, but I felt worried about Robert. It was not like him to leave his guests and disappear in the middle of a party in order to confer with a friend. And while I was thinking that, he came into the room. I went over to him very quickly and said: "Good evening, Robert. Are you glad to see me?" I gave him my best smile. He said coldly, "Not particularly, Kitten. Is there any reason why I should be?" I looked at him in amazement. Then I saw that he had hurt his right hand. There was a large piece of adhesive plaster covering a dressing on the back of his hand. I said. "But I don't understand, Robert! And what have you done to your hand?" He said caustically, "We'll discuss these things later, when all these people have gone. In the meantime, you might try and behave like the Comtesse d'Épernay and not like a—a—" He was so angry he could hardly speak. He turned on his heel and went away. Directly I had an opportunity I sneaked out of the drawing-room. On my way I told one of the maids to ask Robert to apologise for me and to say good-bye to people when they decided to go. I threw myself on the bed and wondered about Robert. Then I had a good cry. Then I began to think about Sebastian Glynn and Clairette and the ridiculous poet Hubert. 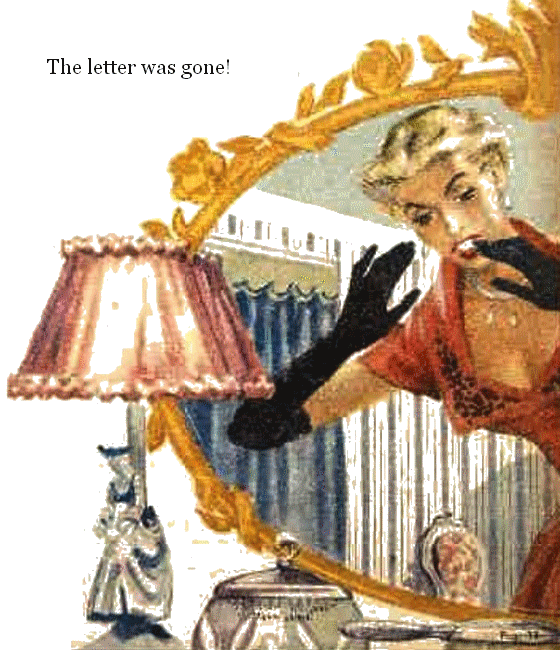 I got up and went to the dressing-table to re-read Hubert's fatuously dramatic letter. When I got there I experienced a rather nasty shock. It was half-past eight when I went into the drawing-room. Robert was standing by the sideboard mixing himself a whisky and soda. "Robert," I asked, "whatever is the matter? Whatever did you mean by that odd remark you made to me during the party? I don't understand." "No?" said Robert. He grinned cynically. The devil of it is that whatever Robert does and however he looks and behaves he's always really quite adorable—if you know what I mean. It's awfully difficult to be really angry with him. "No?" he repeated. "So you don't understand. You carry on an intrigue with a disreputable cretin in corduroy trousers and a dark brown shirt that could do with a good washing. An individual who wears terrible perfumed hair-oil and has the latest thing in not-too-clean fingernails. An..."
I boiled over. "How dare you!" I hissed. "How dare you!" I stood in the middle of the room almost speechless with rage. "A charming scene," I said eventually. "Monsieur le Comte Robert d'Épernay—a member of one of France's oldest families— talking to his wife in a manner that is reminiscent of a not very sober Apache. Behaving...."
"Nuts!" said Robert. Like most Frenchmen he loves using American slang. "Don't bother to put on an act. And don't bother to deny it. I know where you met him and what has been going on. Nothing you can say will make the slightest difference." "That's so very fair," I said icily. "But as you know so much, perhaps you'll be good enough to tell me just where I did meet this man?" "You know perfectly well you met him at the house of that charlatan to whom you go to have your fortune told." My head was spinning. I didn't know what to say, and if I had known what to say I shouldn't have known how to begin. "Perhaps," I managed to splutter eventually, "you'll be good enough to tell me where you managed to obtain this fearfully fatuous extract from some very cheap novelette that you've been reciting. Possibly you will tell me..."
He interrupted. "Yes, I'll tell you. I've had the information first hand. From the man himself. He has the effrontery to come to this house and to tell me in my own library that he intends to go off with my wife; that I am to be divorced; and what financial settlement do I propose to make on her! That's where I got my information. From your weird-looking conquest Hubert Pettiflow—the long and greasy-haired near-poet!" I nearly sprang into the air. Hubert! So that was the explanation. Hubert—Clairette's new boy-friend! I took a pull at myself and refrained from laughing with great difficulty. I just stood there, and, after a moment, managed to assume the most terrible air of injured innocence ever seen. "He told me all about it," said Robert, almost choking with anger. "And then, as if that wasn't enough, after I'd taken him by the scruff of the neck and the seat of his pants and thrown him down the stairs; after I'd done that, I went into your bedroom to find you and discovered, on your dressing-table, that sickening epistle." Robert began to walk up and down the room waving his arms about in a manner intended to be dramatic or poetic or both. "'To where the nodding flowers bend we'll wend our way until the end... Oh, doubly blest, oh dearly missed, oh sweetly met, oh dearly kissed...'"
He began to roar with laughter. And I did some quick thinking. It was really very funny. The unfortunate Hubert had arrived for his interview with Sebastian—whom he had never met; had gone to the wrong flat—it's fearfully easy to mistake our apartment for the Glynns', which is at the other side of the corridor; had walked straight into Robert in the hall, mistaken him for Sebastian; said his little piece and was then thrown out on his ear for his pains. Robert had then gone tearing about the flat and had found Hubert's letter to Clairette—which had no name on it; and was, by this time, convinced of the worst. A lovely situation—for me! I wondered just what my delightful Robert would do when he learned, the truth. This, I thought, is where I must teach the Comte Robert d'Èpernay a lesson. I said, in a small and very hurt voice: "Robert... would you care to listen to me for a moment?" "No," he said, glaring at me. "No... I wouldn't... No... 'Oh sweetly met... Oh dearly kissed...' No, I don't want to listen. I've heard quite enough for one evening." "You haven't heard half as much as you're going to hear," I retorted. "Do you think you can talk to me as you have this evening, Robert? I can't understand it." "Oh, can't you?" said Robert. "There are a lot of things you can't understand. And there, are one or two things that you will have to understand." "Such as?" I queried in what I intended to be an extremely dignified voice. Robert's attitude changed. He put down the cocktail glass, which he had been holding in his right hand, on the sideboard. He shrugged his shoulders. He said in an odd sort of voice: "Listen, you might as well know that I'm not too upset about this business of yours with this Hubert Pettiflow for one reason." I raised my eyebrows, "Really! What reason?" Robert said: "Well, I might as well admit it... so far as I'm concerned there's someone else, too." I felt as if some icy fingers had gripped my heart. I don't think I'd ever realised until that moment just how much I loved Robert. I said airily: "This is most interesting. Perhaps you'd like to tell me about it." He said: "Well, you'll have to know about it sooner or later, I suppose." I asked: "Who is she... and what is she like? I expect she's terribly attractive—very nice? I expect she has all the virtues—all the charm—that I haven't." He lit a cigarette. He said: "Actually, she is very charming a most delightful person. And I'm very, very fond of her." There was a pause; then he went on: "I don't think I've ever thought about any woman so much in my life as I have about her." "I see," I said tersely. This last part of Robert's speech I thought sounded very definite and final. I said to myself, Mignon, my girl... it looks as if you've had it! I asked: "Who is she?" He hesitated for a moment: then he said: "Her name is Dulac—Mademoiselle Angèle Dulac." "Angèle..."I repeated. Some angel! "And may I ask for how long this has been going on?" "I couldn't tell you exactly," he said airily. "But I should imagine just about as long as this business of yours with this Hubert person has been in existence. By the way, if you have to have affairs with people, why don't you pick somebody who washes sometimes?" I almost flew at him. But I restrained myself. I said: "If you don't mind we won't discuss Hubert for the moment. So you're in love? So you can't go on without Mademoiselle Angèle Dulac? You think about her more than you've ever thought about any other woman?" He drew on his cigarette. "What are you getting excited about? You can't accuse me of letting you down. You've let me down." I said: "Well, where do we go from here? It's not a very good situation, is it?" Robert ashed his cigarette and said casually: "Oh, I don't know. It's one of those things, isn't it—one of those things that people tell you you must be sensible about?" He said: "Well, these things can always be arranged. This Hubert of yours was kind enough to suggest that the right thing for me to do was to allow you to divorce me. I'm quite prepared to consent to that. Then you can have your Hubert." "And," I countered, "you can have your Angèle." "Precisely," said Robert, "I'll get in touch with my lawyer to-morrow morning, and we'll get things arranged." He grinned at me. "I'll make it pretty easy for you, Kitten." I said with dignity: "Thank you very much, Robert. I'll leave everything to you. And now, if you don't mind, I'll go and lie down. I have a headache." I went to my bedroom. I lay down and looked at the ceiling. I'd never felt so unutterably wretched in all my life. This, I thought, was the end of everything. I was drying my eyes when there was a tap at the door, and Annette put her head round. She said, "Madame... Mrs. Glynn ees in the drawing-room. I 'ave shown her in there. She ees very excited about something." I got up and powdered my nose. I wondered what Clairette wanted. Advice—I imagined. I thought cynically that it was rather amusing that at a time like this when I was up to my neck in trouble with my own domestic affairs I should have to give advice to Clairette. When I went into the drawing-room she was walking up and down, smoking a cigarette. She said, "My dear... I'm so excited. What do you think?" I said, "I don't know what I think, Clairette. What are you excited about?... Hubert, I suppose..." I added sarcastically. "Yes, in a way," she said. "But I'm fearfully excited about Sebastian. I think he's too, too wonderful." The idea of Clairette thinking the unfortunate Sebastian was too, too wonderful was rather too much for me. I said, "Exactly what do you mean by that?" She said, "My dear... I'll tell you. You know I thought I was fearfully keen on this Hubert Pettiflow I met at this fortune-teller's—the one I recommended to you? Well, I thought I was in love with him, Mignon, but actually, of course, I wasn't. Actually, all the time I've been in love with Sebastian, but I didn't realise it. My dear, isn't it too divine... the idea of being in love with your own husband?" "Definitely a new experience so far as you're concerned, Clairette," I said. "But why this sudden change of front?" She said, "I've just discovered something about Sebastian. Of course, he's not a lot to look at. He's short and plump and rather vague. Sometimes he seems rather ridiculous, but underneath that... underneath that, I tell you, my dear, he's a cave man." I said, "Really! How did you discover this?" Clairette said, "I'll tell you. Hubert had written me a letter saying that he was coming to the flat to-night to have a showdown with Sebastian and tell him that he was going to take me away. Apparently there was an awful row. It seems that Sebastian got hold of him, threw him down the stairs, and kicked him into the street. Isn't it wonderful?" I asked, "Who told you this?" Clairette said, "I heard it from the hall-porter when I came in. He didn't see it, but he'd heard about it from some people who were standing outside." "I see. Well, it looks, Clairette, as if everything's all right for you. I'm glad you've fallen in love with Sebastian." She said, "Yes... I'm going to tell him so when I go in. I think I've been rather stupid about Sebastian." "I'm certain you have," I replied. "However, give yourself a cocktail and smoke a cigarette. Don't go for a moment. I've got to make a phone call. I'll he with you in a few minutes." I went back to my bedroom. I thought that even if I were miserable myself there was no reason why I shouldn't try to give Sebastian a hint for his future happiness. I went to the telephone on my bedside table. Sebastian answered the telephone. I said: "Listen, Sebastian... this is Mignon d'Épernay. Clairette's here. It seems that Hubert Pettiflow arrived here to-night to have his interview with you and came to the wrong flat. He came to our apartment. He saw Robert. He thought Robert was you." "It's not a matter of 'Oh, dear' at all," I said. "It's very good for you. Robert listened to what he had to say and thought he was talking about me, not Clairette. So he threw him out of the flat and kicked him down the stairs." Sebastian said: "By Jove... that was pretty good... I like that!" "I'm glad, I said. "Now listen to me... Clairette says she's fallen in love with you all over again, because she thinks it was you who kicked Hubert out. She thinks you're a he-man. So go on being one. Why don't you come in and collect her? But be tough. Clairette needs that." He said: "All right, Mignon... I will. Just watch me. From now on things are going to be very different in this ménage." "I'm glad of that," I said. I hung up. Everybody, it seemed, was going to be happy except me. Rather miserably I went out of the room; began to cross the hall towards the drawing-room. When I passed the hall table I saw that the telephone directory was open. It was open at the letter "D."
Mademoiselle Angèle Dulac... and she lived not half a mile away. I made a mental note of the number, closed the book, went back to my bedroom. I picked up the telephone and called the number. A very charming voice with a pronounced French accent said: "'Ello!" I asked: "Is that Mademoiselle Angèle Dulac?" "But yes," said the voice. "Who ees that who speaks, plees?" I said: "The Countess d'Épernay." The charming voice at the other end interrupted. "But of course... that will be the dear leetle Mignon... Robert's wife. For so many years I 'ave wanted to meet you and to talk to you. Always Robert was so pleased with the idea of our meeting. "But, alas, the war... and all thees trouble... has stopped that. When I saw 'eem last time... when 'e was dropped in France during the war... such a dangerous mission, _ma petite_... I was able to 'elp him. "And I told 'eem to arrange it as soon as possible. You see, I 'ave known him for a long time... and there ees nobody loves a man more than the woman who nursed 'eem..."
I gulped into the telephone: "Of course, you were Robert's nurse. You see, he'd never told me your name." She laughed. "That doesn't matter," she said. "Yes... I nursed Robert since he was a leetle tiny boy ... so small that you could hardly see 'eem." I said: "Angèle... we're going to meet to-morrow. And we're going to have a celebration. For the moment, _au revoir_." I hung up. I went over to the dressing-table and powdered my nose. I looked at myself in the glass. I thought I looked rather good-looking. The suggestion of tears about my eyes was, I thought, rather attractive. I went back to the drawing room. When I arrived I found Clairette talking to Robert. Robert looked very, very sheepish. I said to him in a grim voice, "Well, has she told you?" He said, "Yes, Kitten... she's told me all about it... an extraordinary coincidence that... fearfully extraordinary. I ought to explain..."
"You don't have to explain anything," I said. "I've just been talking to Mademoiselle Dulac. She's rather sweet, isn't she?" He grinned. He said, "So she told you?" 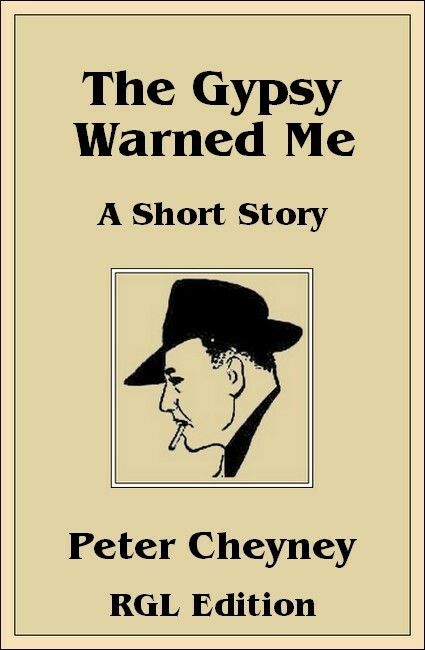 Suddenly their was a prolonged ring on the front doorbell—so long and so loud that I thought the place must be on fire. It was Sebastian. He came into the drawing-room, nodded casually to Robert and me. He said to Clairette, "Don't you think it's time you came home?" Clairette got up. She said in a weak voice, "Yes, darling." I looked at Robert. I said: "I'm very glad that you discovered my taste in men wasn't quite so bad. I'm rather sorry that you thought I could fall for a man like Hubert." He looked very uncomfortable. He said, "Well, one can believe anything sometimes, and when a woman goes to a fortune-teller, one always thinks she is in love with somebody else." I said, "Yes? So you thought that?" He nodded. "I suppose I did," he said. "Of course it was fearfully stupid of me. By the way, Kitten, what did that fortune-teller tell you?" "She told me I was going to have a rather exciting experience with a man "
He said: "Yes? What sort of man?" "A man who is tall, slim, dark, and rather good-looking." I replied. He said: "Oh... Then he looked in the mirror. He began to grin. "By Jove, I'm tall... I'm slim... I'm dark..."
"And in certain circumstances," I said, "you might be considered to be good-looking." He said: "Well, you know what to expect." I said: "What am I to expect, Robert?" 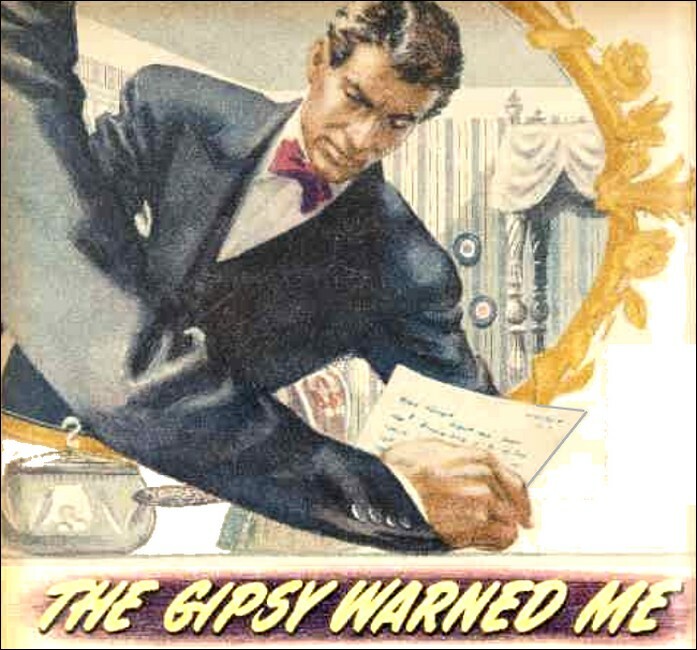 He said: "You ought to know... the gipsy warned you...!"